Close to 15 percent of men and 11 percent of women age 65 and over have some degree of moderate or severe memory impairment, according to the Federal Interagency Forum on Aging-Related Statistics. Not only is memory loss distressing to sufferers and their families, it places people at a greater risk for entering a nursing home. Many people turn to alternative and complementary medicine in hopes of boosting their memory capability, with turmeric being one supplement that might have memory-boosting benefits. Always consult a doctor before taking a supplement. Turmeric is a plant native to South India and Indonesia, with stems that are boiled, dried and crushed to a powder and used in curries and yellow mustard. 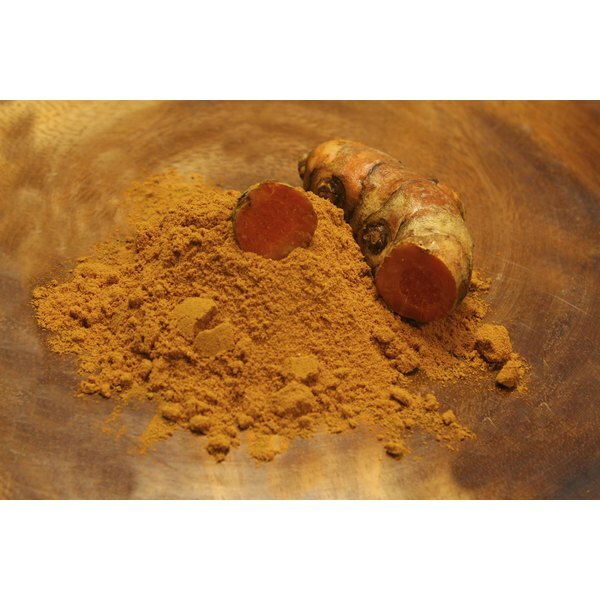 An extract from turmeric root, known as curcumin, has been studied for its ability to improve a variety of health ailments, including Alzheimer’s disease. Curcumin appears to have antioxidant properties, meaning it might decrease inflammation and swelling. Residents of India, who use large amounts of turmeric in their diet, have the lowest rates of Alzheimer’s in the world, according to the World Health Organization. Most adults will experience moments of memory loss as they age, such as forgetting where they put the car keys. Others might suffer from mild cognitive impairment, a disease that affects memory but still is relatively mild, although it can grow gradually worse. Its symptoms include difficulty in remembering recently learned facts and an inability to acquire new information. The more severe forms of memory impairment include dementia and Alzheimer’s disease, a progressively debilitating condition that slowly destroys memory and thinking skills. It is believed that beta-amyloid plaques in the brain as well as oxidative stress, harmful free radicals and inflammation are all key components in the development of memory problems, particularly as related to Alzheimer’s disease. A study published in September 2010 in the journal “Neuroscience” fed curcumin extracts to rats with amyloid-beta plaques and found that the curcumin improved spatial learning and memory. Curcumin might have benefits for non-Alzheimer's memory loss as well. Findings published in the May 2010 issue of “Pharmacology, Biochemistry and Behavior” showed that curcumin extracts helped improve learning and spatial memory, as well as the concentration of brain neurotransmitters in healthy aging rats. A 2009 study published in “Neuropharmacology” also demonstrated that curcumin reversed impaired cognition in laboratory mice caused by chronic stress and boosted learning and memory in the animals. There aren’t any major side effects associated with normal consumption of turmeric. Higher doses can increase your body temperature and might increase oxalic acid in your urine, which is a problem if you are prone to kidney stones. Although long-term use of turmeric extracts hasn’t been studied in humans, author and physician Dr. Ray Sahelian says you can take one to three turmeric capsules daily without any significant problems. It’s estimated that people in India consume about 2 grams of turmeric a day. Neuroscience; Curcuminoids Enhance Memory in an Amyloid-Infused Rat Model of Alzheimer's Disease; T. Ahmed, et al. Pharmacology, Biochemistry and Behavior; The Influence of the Long-Term Administration of Curcuma Longa Extract on Learning and Spatial Memory as Well as the Concentration of Brain Neurotransmitters and Level Of Plasma Corticosterone in Aged Rats; J. Pyrzanowska, et al. Neuropharmacology; Curcumin Reverses Impaired Cognition and Neuronal Plasticity Induced by Chronic Stress; Y. Xu, et al.